Marina Delio, aka @yummymummykitchen, is an inspiring mother of two who is all about real food, culture-rich travel, a balanced lifestyle, and inspiring home projects. Through her Yummy Mummy Kitchen blog, she passes on her philosophy of easy living and nourishing plant-based recipes with a pop of glamour. We love her flavorful gluten-free desserts like this easy French toast casserole. The holidays have arrived and we are doing tons of baking. The girls have decorated their gingerbread houses and our tree has been trimmed. Our weekdays are so rushed, that I like to make a special breakfast treat on the weekends. My family loves French toast, and I’ve found an even simpler and tastier way to make it. This vegan and gluten free baked French toast casserole takes just a few minutes to prepare. 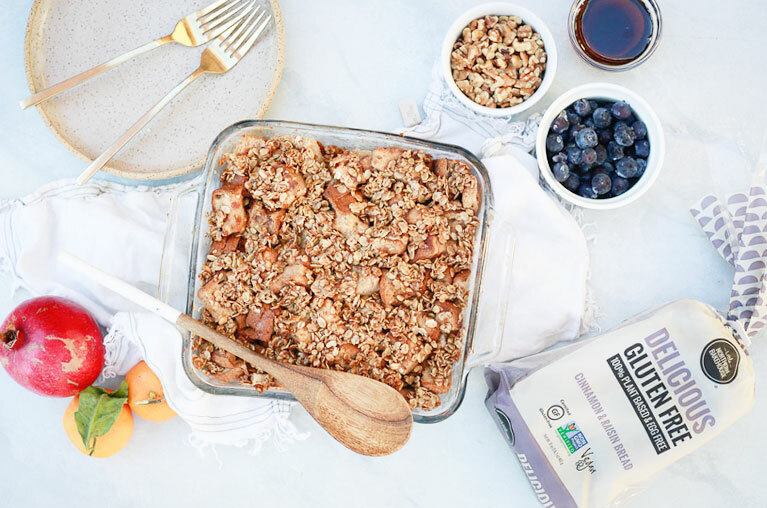 It’s lightly sweetened with banana and maple syrup and topped with a crumble oat crisp topping. Soft on the inside, and crunchy on the top, a baked French toast casserole is sure to be a hit for a holiday breakfast. Place the coconut milk, almond milk, flax meal, banana, maple syrup, cinnamon, and vanilla in a blender and blend until smooth, about 30 seconds. Fill the prepared baking dish with the cubed bread and walnuts. Pour the liquid over the bread and gently toss to coat. The bread should be just lightly coated, so you may not need all of the liquid. In a small bowl, crumble together the oats, butter, and sugar. Sprinkle over the French Toast. Cover the dish with foil and bake for 45 minutes. Uncover and bake another 10 minutes. Allow to cook slightly. If the filling is too wet and soft, cover the dish and again and bake another 10 mins.